Starla, the elegant… This model is a perfect example of how a mobility aid product can be synonymous with refinement. No “hospital” style here! Starla shows that a stairlift can not only solve problems going up and down stairs, but also add a touch of class to your interior. 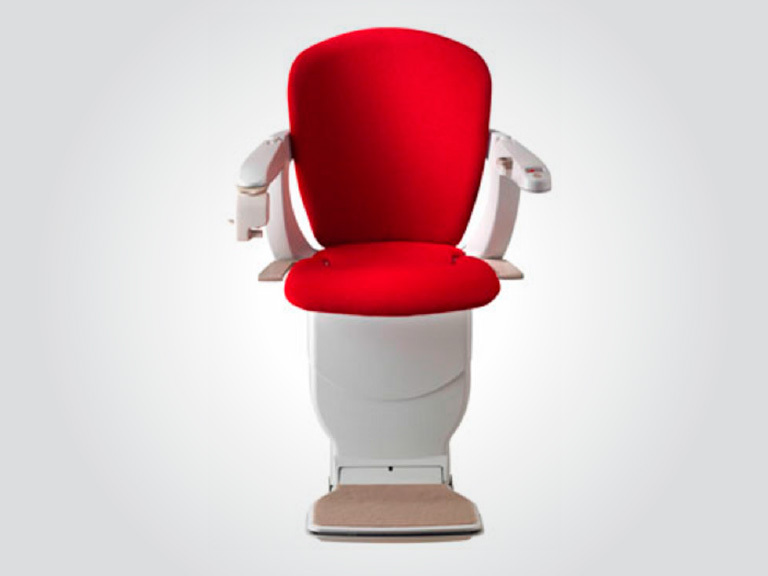 This stairlift is designed for those for whom look and design are top priority, whether in their own home or to keep their business feeling a certain way. Have you invested a great deal of energy into creating a unique style for your business? Want to make it accessible, while keeping the feel that was so difficult to create? Do you like the warm décor of your home and do not want to make any compromises? You can make any place beautifully accessible with this stairlift, which offers a variety of colour, trim, texture and other options. Have a specific look in mind? Tell us exactly what you want and we’ll make it for you. Variable (price may vary depending on the options selected). Contact us for your personnalized quotation. Special order. Allow time to select colours, textures (wood or vinyl trim, etc.) and other options. On average, 4 to 6 weeks. A full day, about 8 hours. • Footrest, seat and armrest fold, allowing others to use the staircase safely. • Because the footrest is mechanically connected to the seat, the seat can be raised and lowered effortlessly. It can also be automated. • Footrest has an obstacle detection system. • The swivel seat makes it safer to get in and out. • The removable key prevents unauthorized use. • The seat belt provides safety during movement. • An indicator light on the armrest lets you see the stairlift. Élévaction specializes in the sale, installation, maintenance and repair of mobility aid equipment across a vast area (Sherbrooke, Granby, Cowansville, Drummondville, Thetford Mines, La Beauce, Lac-Mégantic, and many more). Monday to Thursday: 8 a.m. to 8 p.m.
Saturday and Sunday: 8 a.m. to 5 p.m. Call us anytime. If you are unable to reach us, leave us a message and we will get back to you promptly.